Let's face it, there is not always so much time or energy to pack your yoga gear and head down to a busy yoga studio for an hour of yoga, no matter how sweet the class may be. Sometimes all you need is a quiet walk in the woods, or an easy neighborhood stroll to get some fresh air and fresh thoughts. Walking is a great exercise in not only moving our body, but also in moving the mind. During walking, we get unstuck and we may see options for problems we haven’t seen before. So next time you take a stroll or a hike in the woods, here are some yoga poses you can do and incorporate into your walk to get that extra bit of movement into your day. Easy to do everywhere, the side stretch is a nice opening and stretch for the side of the body. Stand with your feet hip-width apart, and lift up your arms above your head. Start stretching to your left, taking a hold of the right hand with your left. You can also stretch just one arm at a time, leaving the other arm by your side. Stretch to the opposite side from which your arm is up. Stretch from side to side for 4-6 times. To stretch the shoulders and upper back, and to release tension we so often carry around in this area, you can move your hands into the Eagle pose. Cross your arms by bringing the right arm under the left, elbows stacking. Bring the forearms towards the sky, and have either the backs of the hands touching, or twist to have your palms facing each other. By lifting the elbows you will feel the stretch in your upper back. Find your sweet spot and take 5 long breaths there, before switching sides. The forward bend is great for relaxing the entire back and calming the mind. Stand with your feet hip-width apart, and start to bend forward. Keep your knees bent, and have your tummy touching the thighs, leaving the back nice and long. Place your hands on the ground, or take a hold of the elbows. You can even swing gently from side to side to loosen up the back even more. Take 5-10 long breaths here. To stretch the legs and the hip flexors, step into a High Crescent lunge pose. Start by standing with your feet hip-width apart, and step one leg behind you, heel off the ground, toes and hips pointing towards the front. Bend the front leg, keeping the back leg straight. Make sure to keep the front knee above the ankle. Lift up your arms towards the sky, palms facing each other. Keep your neck neutral. Stay for 5-10 breaths before switching sides. To stretch your legs, feet and ankles, and to calm your mind and nervous system, spend some time in the Wide legged forward bend. Start by facing forward, standing with your feet wider than hip-width apart. Place your hands on your hips, and start to pivot forward from your hips. Place your hands on the ground, or on a park bench if you cannot reach the ground. Straighten your spine on an inhale, and on an exhale sink deeper, eventually walking your hands between your feet. Stay for 5-10 breaths. 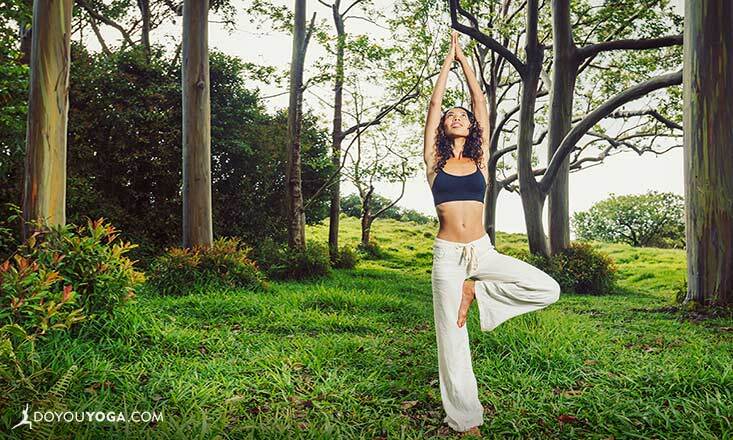 Get in touch with the nature around you while practicing your balance. Pour first all of your weight onto one leg, and lift up the other foot to either lean on your shin, or on your inner thigh. Take your palms together in front of the heart, or if it's comfortable, raise the arms above the head. You can also keep the arms open if this feels better for your shoulders. Stay for 5 breaths before switching sides. Do this twist while getting some healing energy from nearby trees (or find a wall to support you). Twists give you a great rotation of the spine and a stretch for the muscles in your back. Start by standing with your feet hip-width apart in front of a tree, approximately an arm's length from the tree. Place your right hand on the tree, your left hand can be on your side, or you can take a hold of your right hip with your left hand. Keeping your legs and hips straight, start twisting towards the right, helping yourself into the twist with the right hand. Imagine twisting from the belly, ribcage and shoulders, and finally turning your head to look towards the tree, if this feels comfortable. Stay for 5 long breaths and slowly release the twist with an exhale before switching sides. We often forget that yoga is not tied to indoors or places where we can roll out our yoga mats. Yoga is wherever our bodies are. Play with the poses, do one pose here and there, and enjoy the great outdoors!